A wonderful way to teach the Bible, our Back to the Bible Correspondence Course helps non-Christians learn how to become a Christian, and helps Christians increase their Bible knowledge. 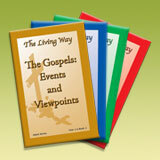 Each lesson teaches a specific area of the Bible. Emphasis is given to how one becomes a Christian and how to live a Christian life. A grading key and completion certificates are also available.